Mile 13: As I began the long downhill from Kancamagus Pass into Conway, NH, I stopped at a lookout just below the pass to take this photo. The day was very overcast and rain was expected as you might tell from this photo. Fortunately, the rain held off until after the downhill (wet roads makes downhill riding dangerous, scary, and stressful). Today may have provided the most beautiful scenery that I did not get to view on our cross country tour. 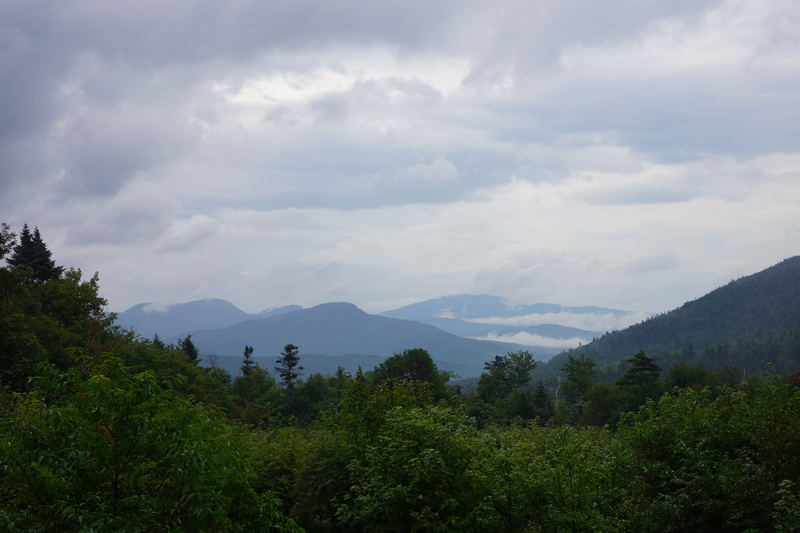 Overcast skies, fog, and rain combined to thwart enjoyment of the beauty of New Hampshire and Maine scenery. 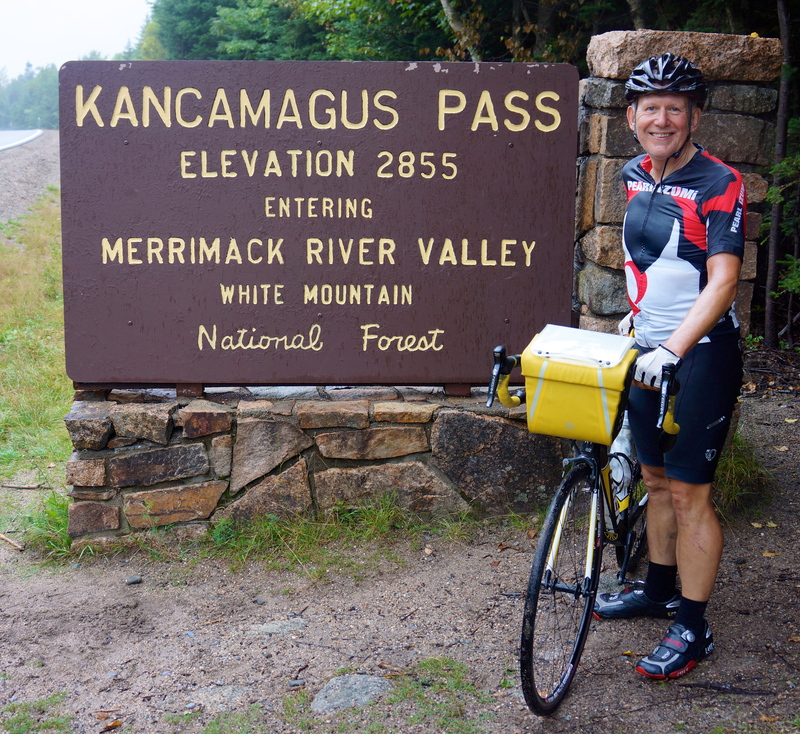 The day started with a 12 mile, 1,900 foot climb to Kancamagus Pass in the White Mountains of New Hampshire. Fortunately, it was a relatively gradual climb (4% to 7%) on a relatively smooth and wide shoulder. Dave from Grand Rapids and I decided to bike to the pass together and had a great conversation, particularly about his and Susie’s exceptional volunteer work several times each year as physicians in third world countries (Susie, who is a family practice physician, is leaving for Nepal for a two month assignment this fall). The long (12 miles) ride down from Kancamagus Pass was cold (needed to put on a jacket and gloves), exciting (fast), stressful (some wet spots) and, most importantly, uneventful. At mile 42 we entered our last state of the cross-country tour, Maine. Doug, Jim, Robert, and I spent what felt like 30 minutes for individual and group photos with the “State Line Maine” sign (and the “State Line New Hampshire” – see photo below). 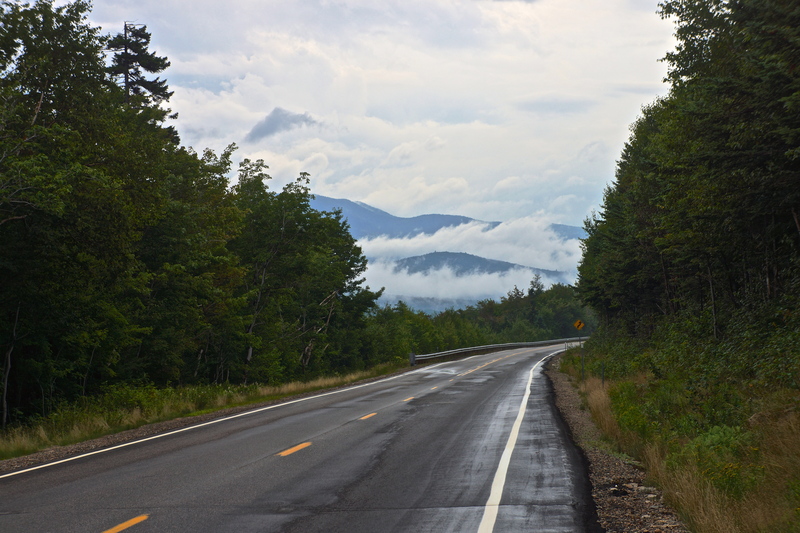 Shortly after entering Maine, the rain with an occasional downpour began and continued for the rest of my bike ride (2 hours) to the lodging in Bridgton, ME. At mile 56 the SAG wagon (with some riders who decided that only crazy/obsessed cyclist, like me, would continue to bike under these weather conditions) pulled up next to me so Diane and Dale could get my advice on the route. It happened that a street sign at a critical turn was missing and I was able to confirm the turn with my bike computer which has a GPS that shows street names. Somehow, I was the first rider to arrive (on a bike) at the Pleasant Mountain Inn. I felt energized (to everyone’s surprise), accomplished, comfortable, drenched, and very pleased with my Gore-Tex, Pearl Izumi, and Taiga rain gear. A long hot shower never felt better. Dinner at the Campfire Grill next to our lodging was outstanding which topped off a good day. It is hard for me to believe and accept that I only have one more day of biking to complete the Pacific to Atlantic bicycle tour! I have three notable (at least to me) personal accomplishments to maintain for one more day – 1) Biking every mile of the tour (I don’t count the two miles in Montana when I was forced by the State of Montana to ride in a Department of Transportation pickup truck through a construction area with a grizzly bear grazing with a cub), 2) Biking through every weather situation without stopping or waiting it out in the SAG wagon, and 3) Not having a flat tire (4,025 miles – thank you Specialized for your Armadillo All Condition Bicycle Tires). Our lodging in Lincoln, NH (very touristy at an exit from Interstate 93), the Kancamagus Lodge. Lincoln is at the entrance to the White Mountain National Forest. Last evening dinner was “on your own”, so Robert, Jim, Doug and I dined at the Common Man across the street from our lodging, which was excellent. My Uncommon Salad, “Seasonal greens tossed with balsamic vinaigrette and topped with Gorgonzola and candied hazelnuts, lobster Mac & Cheese, and Apple Tart, “A buttery flaky puff pastry layered with fresh ripe apples and baked golden brown. Served warm with C-man made vanilla ice cream and drizzled with caramel sauce (which I ordered only after craving it when Doug and Robert were served theirs) was delicious. Additionally, the Common Man had a 1/2 price wine bottle night so Robert ordered the white wine and I ordered the red wine (Josh Cellars Cabernet Sauvignon – excellent). I highly recommend the Common Man (multiple locations). 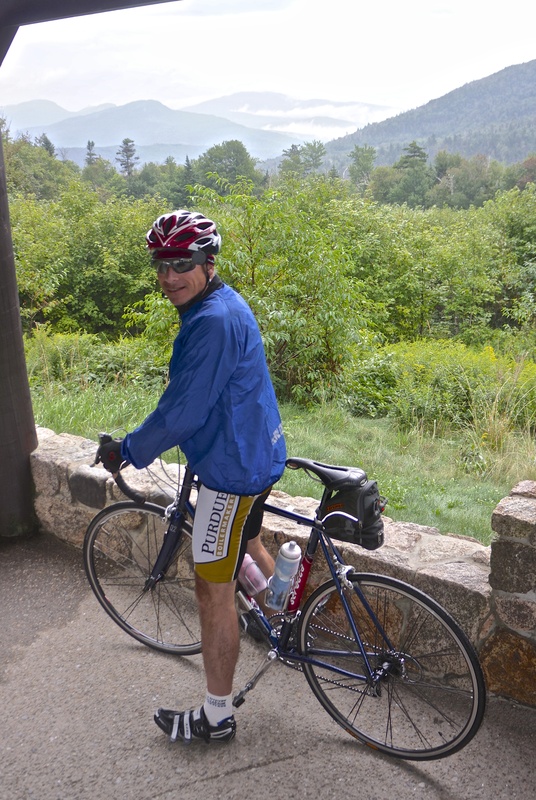 Mile 12: The ride from Lincoln started with a 12 mile, 1,900 foot climb to Kancamagus Pass in the White Mountains. Fortunately, it was a relatively gradual climb (4% to 7%) on a relatively smooth and wide shoulder. Dave from Grand Rapids and I decided to bike to the pass together and had a great conversation along the way. Thanks Dave. When Dave and I reached Kancamagus Pass, there were Diane and Dale with the SAG wagon, waiting with refreshments, encouragement, and praise. 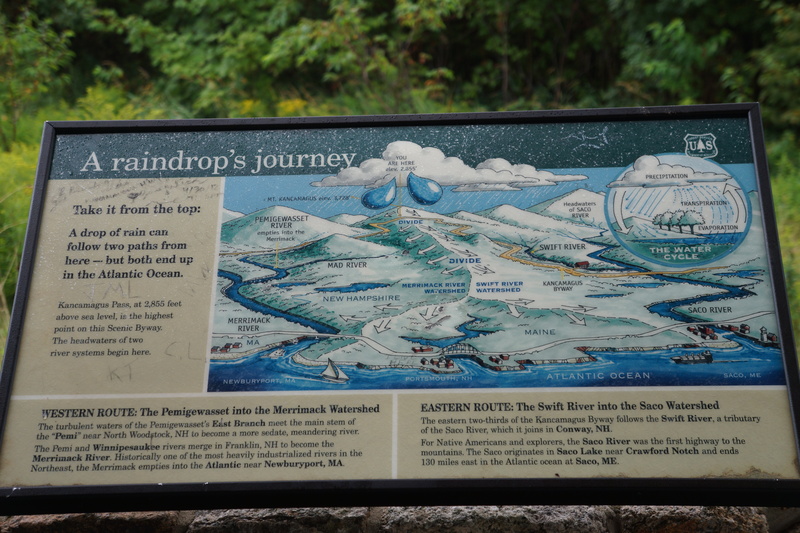 Mile 13: An educational marker about rain drops at Kancamagus Pass. Mile 13: Doug at the Kancamagus Lookout showing the appropriate attire (except for insulated and waterproof booties which I highly recommend) for a long, cold, downhill bike ride. Mile 15: Another view of the downhill ride from Kancamagus Pass. It was very tricky stopping the bicycle to take this photo as I was traveling close to 35 mph when I saw the view (which would disappear around the curve) and the road was slightly wet in spots from an earlier shower. 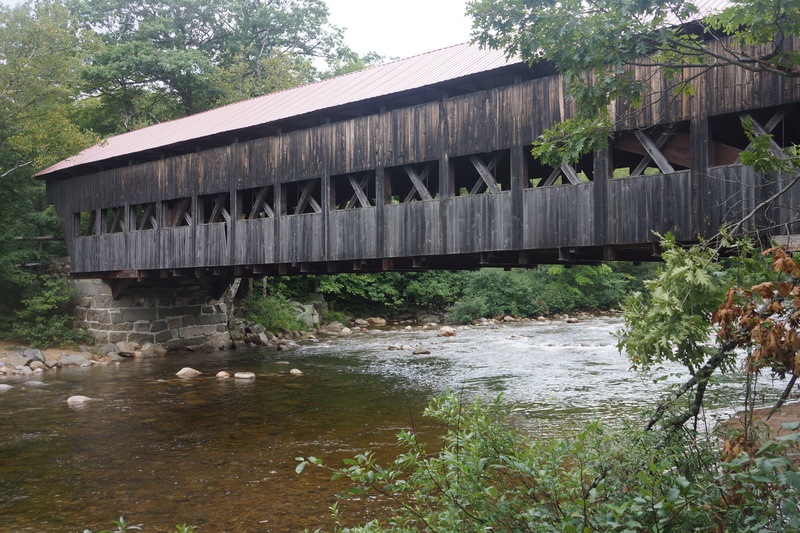 Mile 27: This is the Albany Covered Bridge (see marker below) which I crossed on the ride today on my way to Conway, NH. 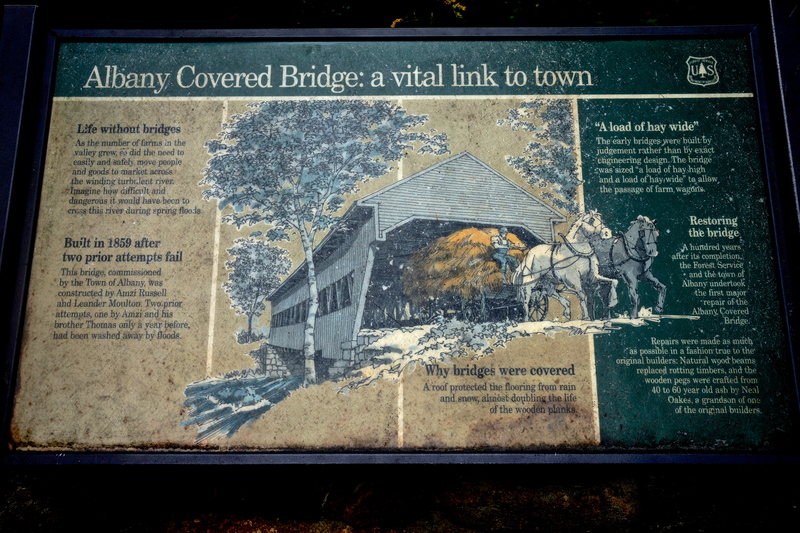 Mile 27: Historical and Educational Marker about the Albany Covered Bridge. 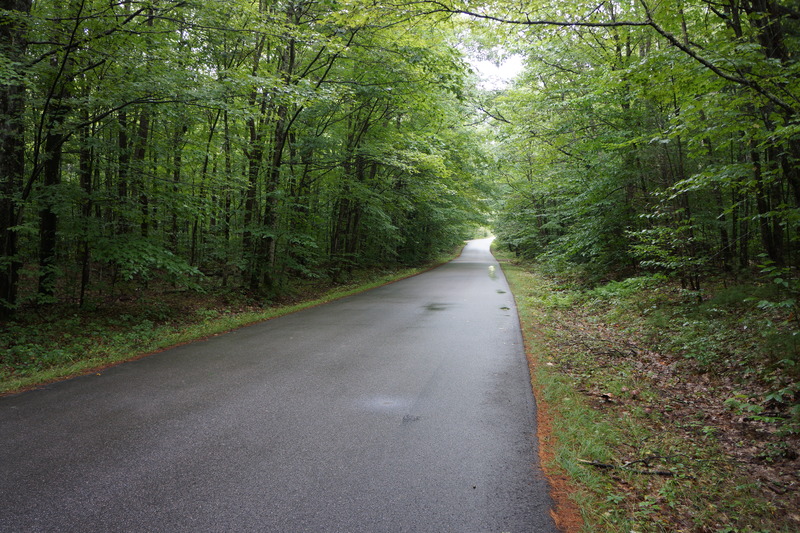 Mile 28: After crossing the Albany Covered Bridge, I biked on this beautiful road, Passaconaway Road, for 5 miles on the way into Conway, NH. Mile 42: For Robert fans, here he is entering the last state of our cross country tour, Maine, at the border of Conway, NH and Fryeburg, Maine. Mile 42: Entering my 15th and last state, Maine, on my cross country bicycle tour. Mile 42: This sign is somewhat out of sequence. Since there was no “Welcome to New Hampshire” sign when we entered New Hampshire yesterday from White River Junction, Vermont, Jim, Robert, Doug and I used the other side of the “State Line Maine” pictured in the previous photo to document our visit to New Hampshire. 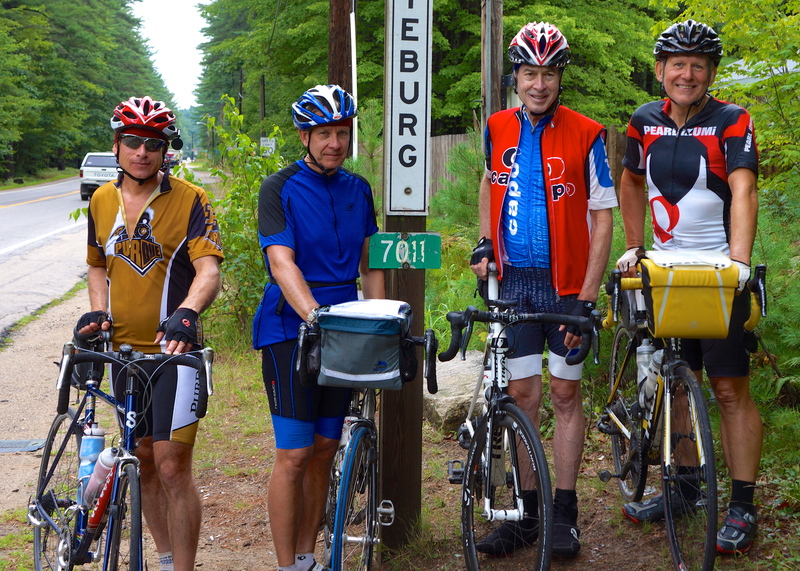 Mile 42: A group photo of, left to right, Doug, Jim, Robert, and me as we enter the 15th and final state (Maine) of our cross country bike tour. This entry was posted on August 22, 2012 by Steve. It was filed under Photograph of the Day .